JUST DUCKY! : Caturday - Happy Blogoversary to Me! It is our blogoversary today, in addition to being Caturday. 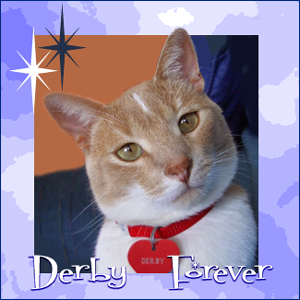 Derby started this adventure way back in 2005, which was 13 years ago. I wasn't even alive yet, I bet my kitty mom and dad had no idea that they would even create me! So over the past years there have been over 2700 posts and over 37,000 comments! Derby, then the both of us, now me, sharing what is going on around here with mum. The good, the bad, the silly, the sad. Mum's favorite pic of Derby, we do miss the big guy. He would be 15 now if he was alive. Sad that he left for The Bridge so soon. So, we start another year of adventures. Glad you are here to read along. Congratulations Ducky on continuing a long tradition started by Derby (with help from your mum). Long may it continue. Aww, well Happy Blogoversary. Bittersweet, but glad you've been keeping it going. Here's to the next one! Happy Blogoversary Ducky and mum! We didn't meet you 'til Derby had run for the Bridge but we knows he was a pawsome kitty. Have a great Caturday with lots of snuggles and scritches. 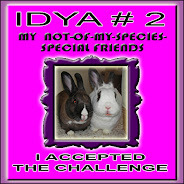 Congratulations, Ducky and Mum and Derby ! Happy blogoversary Ducky, and of course to your mum and Angel Derby. Derby was a handsome boy and so are you. Happy Blogoversary! Congratulations, belatedly, on 13 years of blogging! That's more than us! Keep up the great work. We just love your posts! Happy Blogoversary! Angel Derby is still watching over you, and he knows you are doing a great job, Ducky!